When the Anaheim Ducks defeated the junior varsity Washington Capitals in the final game of the 2015-16 NHL season, the playoff picture was officially set. The win gave Anaheim their fourth straight division title, and placed the Los Angeles Kings immediately in the cross-hairs of a familiar foe. Fill it up again, because it’s Sharks vs. Kings. No Cal vs. So. Cal. And it’s only round 1 of the grueling Stanley Cup Playoffs. Truthfully, this was the matchup I was hoping the Kings would get. While the Nashville Predators (Anaheim’s round 1 opponent) are certainly formidable, this series will force L.A. to engage right from the onset. The Sharks detest the Kings, down to their socks and shin pads. The last two times these clubs met in the playoffs, San Jose lost deciding seventh games. In the 2014 rendition, the Sharks became one of only four NHL teams to blow a 3-0 series lead, and then had to watch the Kings hoist the Stanley Cup in that same postseason. Each loss still resonates in San Jose’s locker room, and you can bet that they will look to punish L.A. from the moment the puck drops in the first game. Getting by the Sharks will be difficult, but it can pay dividends down the road. Did I say it would it be difficult? Because I wanted to make sure you knew that this would be difficult. San Jose has developed a reputation for under-performing in the playoffs, but nobody in the hockey world can deny the talent on their roster. In the 2014-15, the Sharks failed to compete, trotted out subpar goaltending, and saw the locker room nearly implode as they missed the postseason entirely (sound familiar Kings fans?). After a year of self-reflection and a return to inspired hockey, the Sharks are back in the playoffs. But these aren’t your older brother’s Sharks. San Jose still has some big, physical veterans, but they have also redesigned their lineup to showcase youth and speed. Here’s what the Kings are going to have to deal with in order to avoid a massive shark attack in the first round. At 31 years of age, Sharks forward Joe Pavelski has firmly established his dominance among NHL goal scorers. Some were quick to call Pavelski’s 41 goal campaign in 2013-14 a fluke, but the pride of Steven’s Point, Wisconsin, has refuted such claims. He’s notched 70 plus points each of the last three seasons, and finished this year with a career high plus/minus of +25. Let’s not kid ourselves though; Pavelski’s rise to power was not forecasted. This was a slightly undersized 7th round pick from Wisconsin who’s had to earn everything he’s achieved in his career. And Pavelski has done just that. Pavelski got annihilated, got back up, and scored. I can guarantee that every San Jose player was thinking the same thing when they saw that relentlessness personified. That’s my teammate. I want to share the ice with that guy. Since Pavelski was named captain, nothing has changed with his approach to the game. And that’s why his production has remained consistent, and why his team began to follow suit. The Kings are going to have to make life difficult for Pavelski, and play to the fact that he’s not the biggest guy in the world. Defensively they are going to have to communicate, and make sure they are staying with their man when Pavelski begins to cycle below the goal line. But more than anything, L.A. has to maintain puck possession. 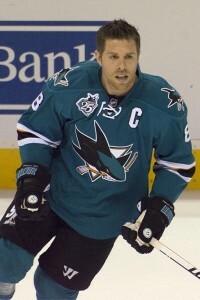 Pavelski loves to play the same way the Kings do; with the puck on his stick for extended periods of time. This methodical approach works wonders for both teams, and whoever can control the action the most will be limiting their opponent’s chances. Seems basic enough right? Well try telling Joe Pavelski he can’t have something and get back to me. A pair of NHL players I have been following for almost two decades are Joe Thornton and Patrick Marleau. 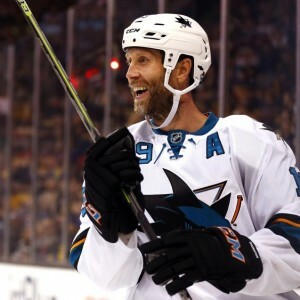 Thornton’s a prized trade acquisition from many years ago, and Marleau’s a San Jose lifer. 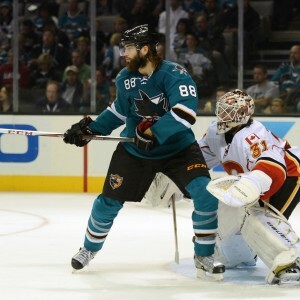 Both players helped transform the Sharks into the Western Conference contender they were for many years, but neither could help push their club over the top and into the Stanley Cup Final. It’s clear both are slipping, and as recently as last year it was unknown if both would be around for one final push with the Sharks. But something interesting happened. Both Thornton and Marleau, perennial all-stars and Canadian Olympians, decided to adjust their game for the good of their team. Many veterans hang on way too long and struggle to give up the spotlight to the next generation (Brett Hull, Chris Chelios, Mel Gibson). Instead of that route, the Sharks senior members decided to age gracefully. Pavelski emerged unimpeded. Other young forwards grew into larger roles. And each San Jose veteran adjusted their game to fit the current, defensive oriented style that their team embraces. This was a huge development, considering that in Thornton’s case he was stripped of the Sharks’ captaincy and almost had a locker-box session with his general manager last season. He’s still a deadly playmaker, even if his legs are leaving him. The Kings need to ensure that Thornton doesn’t get the time he desperately craves at this stage of his career, or they will run the risk of leaving themselves vulnerable to his dazzling passing ability. 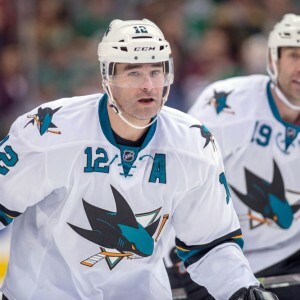 Marleau might have lost several steps, but with 20 years of professional hockey experience and the same hands he’s always had, he poses a significant threat when the Sharks are on the power play. L.A.’s penalty kill has to be on point, because that is when Marleau and Thornton are most deadly. There’s one player that enables the Sharks to transform into something absolutely terrifying. Brent Burns has had a few stints at forward, in large part due to his over-aggressive nature on the point. San Jose never questioned his scoring ability, but they really needed the 6ft 5’ 230lb mountain man to reel it in and play within their system. Mission accomplished. Burns has finally figured out how to create chaos in the offensive zone without being disruptive to his team’s own defensive efforts. He is the ultimate x-factor; a defensive giant who can skate and shoot as well as a speedy forward. Burns’s recorded 27 goals, 75 points, and was an anchor in front of his goalie. L.A. has plenty to worry about with Burns, but the fact that he will hound every position should make him easy to understand. There can be no slacking, no coasting, and no keeping your guard down. If they do, Burns will pounce. The Kings best chance to neutralize Burns will most likely be on counterattacks, after the aggressive defenseman seeks out a scoring chance. If he overcommits as he is prone to do, L.A. can expose the Sharks with odd-man rushes. But as long as the bearded blue liner is on the ice, San Jose will be looking for offense. We’ve touched on the top 4 scorers for the Sharks, but the offensive production after their big guns is where this series may be won. San Jose has long been assessed as a top-heavy team, and one that has failed to add the depth around their stars in order to reach that next level. Do they have enough this time? Tomas Hertl is just 22 years old, and is already electrifying the league with his slick stickhandling and his love for stuffed animals at Dave & Busters. Logan Couture has an all-around offensive game, but has struggled to avoid injuries as he reaches his peak NHL years. Joel Ward was brought in from Washington to be the physical grinding presence San Jose has long needed, but he will only be evaluated by his postseason performance. All in all, the Sharks’ scoring depth is a mixed bag of talented, yet unproven forwards. Here’s the biggest advantage the Kings will have in this series, and the area where they can attack mismatches to generate scoring opportunities. Few Sharks at the bottom of their lineup have proven that they are ready for the big stage, while the Kings are able to roll four lines of with playoff experience late into games. I have no doubt that the Pavelski’s and Thornton’s will be able to go stride-for-stride with the Kopitar’s and Carter’s, but what about San Jose’s third and fourth lines? If the Kings can exploit that inexperience and provoke some undisciplined play from the Sharks, it may lead to the ultimate difference on the scoreboard. Moreover, just a few ill-timed San Jose penalties might give L.A. the special teams advantage that determines the victor. Everybody looks at how the stars produce in these matchups, but it’s often the role players that go the longest way in determining the outcome. Goaltending can win or lose you any series, at any time, at any place in the game of hockey. The Kings boast Jonathan Quick, who I think we all can agree is somewhat dependable. 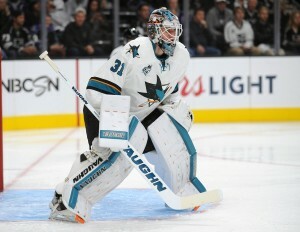 San Jose addressed their goaltending woes by raiding L.A. of their highly touted backup, Martin Jones. It’s been a sensational campaign for Jones in his first full season as a starter, as he won 37 games and finished with the 7th best goals against average (2.27) in the entire NHL. But Martin, we’re not in Kansas anymore. There’s no track record on Jones in the postseason. That doesn’t mean he will fail, but that inexperience can play be an important factor in this series. How quickly will the young netminder adjust to the feverish pace of action he’ll face? Will he be able to keep his emotions in check? And how will he respond after giving up a soft goal? Some questions cannot be answered until we have concrete, playoff caliber evidence. The Kings have proven that they can breakthrough on Jones, but it takes a multifaceted approach. They absolutely have to generate traffic in his grill, and make it tough for the young goalie to see shots clearly. Jones has not allowed many goals, a testament to himself and his teammates. But his save percentage is .918, a solid but not exuberant number compared to his counterparts. L.A. should pepper him when they get the chance, forcing him to makes saves early and often, while reminding Jones that their team is capable of shooting (and scoring) from everywhere. The Kings puck possession game can work wonders this time of year, but they can’t be afraid to pull the trigger when opportunity knocks. Carter, Toffoli, and every grinder who steps on the ice have to execute from the shooting lanes. And as I’ve said before, the Kings might be able to get in Jones’ head. This was their former teammate, a confidant for many, and somebody they practiced with on a daily basis. A goal on Jones could go a long way towards disrupting his confidence, and reminding him that at this level, the big boys play for keeps. Jones is a talented goalie, but his time might not be now. It’s up to the Kings to let him know that. This feels a whole different from your typical opening round matchup. If history’s any indication, then a Sharks vs. Kings series will never be routine.